My "Hands-on Photography" columns are usually directed towards how craftspeople can photograph their own artwork, but this month's piece is an exception. This is a guide for those of you who decide--for any one of a dozen reasons--that it is time to have photographs taken by a photographer. Hopefully these tips will help you choose the right photographer and avoid the misunderstandings that sometimes occur when two artists work together. When it comes to crafts photography there are issues of copyright, fees, and usages that need to be dealt with upfront. The starting place is finding the right photographer. Crafts photography is a subset of a subset when it comes to photographers. Professionals usually shoot weddings, sports, or big products and few have experience with crafts--particularly when it comes to shooting something like polished gold jewelry. In the days of film when you needed to shoot jury slides, the photographer had to have a modicum of knowledge and training about cameras, film, and lighting. Today, thanks to digital cameras, everyone is a photographer despite lacking knowledge of camera control and lighting. This makes it all the harder for pros and for finding a good one. 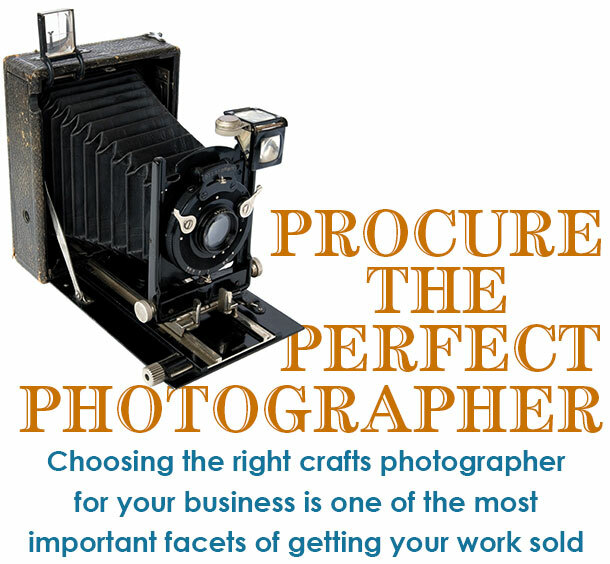 Locating a photographer who specializes in crafts is particularly difficult because most photographers shoot weddings, work for a newspaper, or capture images for corporate clients. These pros don't necessarily understand what makes a good crafts photo, nor do they have the specialized equipment needed for something like close-ups of small objects. They also don't know what juries are looking for, what e-commerce websites need, or what publications use. A photographer's portfolio and tear sheet showing how their photographs get used it a good indicator of their credibility and talent. Search the Internet. Most photographers have websites that can be found through a Google® search. 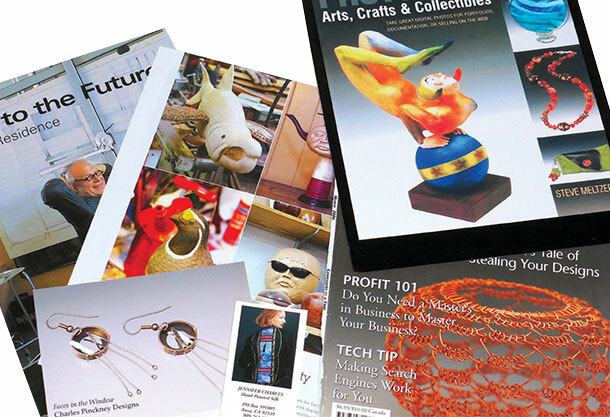 Check for listings in specialized publications. Talk to other artists about the photographers they've worked with and get recommendations. Speak with gallery and shop owners and ask them if they know anyone who shoots crafts. Ask to see their portfolio of crafts photos. Look for photographs of work similar to what you create. Reviewing a portfolio is the best way to eliminate the amateurs with cameras. The photographs should be clean, crisp, and sharper than anything you can do. The photographer's portfolio should include ‘tear sheets,' which are printed copies of how their craft images have been used by clients in posters, ads, publications, and websites. If possible, try to meet with the photographer in person to see the portfolio. It will help to give you a sense of whether or not you can work together. Make a list of your expectations. How many pieces do you want photographed? How many shots of each would you like? Include detail shots if you want them. How are you going to use the photos? Decide what kind of files you want? JPEGs, TIFFs, or both? Decide whether you want large files for publication and/or small ones for juries. How do you want the images delivered? On a flash drive, CD, or over the Internet? Ask if you can make prints from the files. After presenting your lists, tell the photographer what your budget is for your project. Next, it is time to talk rights and usages--the area that is the source of most conflict. A contract helps clear the air. Put an agreement in writing including how you will get the photos. In my case clients get a flash drive or CD of the images. Copyright is established when artwork or a photograph is created. The creator is automatically protected under federal (and some cases international) law as the owner of the rights to the work. Placing the copyright symbol on the work, such as "photo © Steve Meltzer 2016," is designed to tell the world--hands off, this is mine. Unfortunately, in the Internet age, the copyright symbol offers much less protection than it used to. 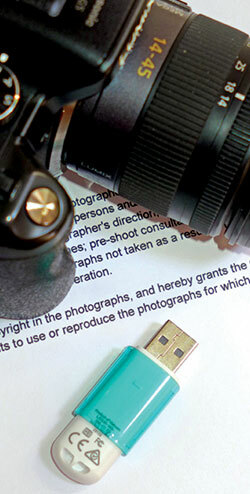 Copyright protection gives both you and the photographer the same rights. The work is under your copyright, but the photographs are under the photographer's. This is why the discussion of who can do what--with what--is so very important. You and the photographer need to agree what each of you can do and can't do with the photographs. You also need to make it clear to the photographer that it is unacceptable for them to put their copyright in the form of a watermark in your photos. Your crafts images should bear your name and copyright only. Connected to the copyright issue is the way each photographer does business and gets paid. Some photographers are very possessive about copyright. There is no reason for you to have to pay the photographer every time you make a jury submission or if you want to make a display print for your booth. If you are paying for the photography you must get something for the expense. For example, when I work with artists I bill on a "work for hire" basis. This means that for a fixed price I will shoot a certain number of pieces, and upon payment the artist gets to use the images anyway they wish. Giving artists the usage of their images creates satisfied customers who will come back year after year. I make my money through taking photographs rather than charging clients for every little photo they use. However, it is a different scenario when I shoot for corporate clients. I charge them standard commercial rates based on either shooting time or image usage and it is on a "fee for use basis." I retain copyright. Pricing is another hurdle for crafts photographers. There are no pricing guidelines to use as a reference. Therefore, the cost of a shoot comes down to what you and the photographer can agree upon. If a photographer tells you they will shoot your work for $10 per piece that's amateur pricing, so don't expect too much from the photos. On the other hand, if they want to charge $2,000 for a day of shooting a half-dozen pieces quickly find the door. This is a commercial photographer who really doesn't want your business. Once you've come to an agreement, put it in writing. A verbal agreement, while legally binding, is not as good as a written contract stating the work to be done, the rights and usages agreed upon, and the cost. One day at my local camera shop an elderly couple came in and stood next to me. They had a large envelope whose contents they laid out on the counter. They had six yellowing, old black-and-white prints of their wedding in the 1950s. The salesperson asked them what they wanted. They told him that it was their 60th wedding anniversary, and they wanted copies of the pictures to send to their large family which was now spread across the country. The salesperson looked at the photos and turned them over where he saw that each had a studio copyright stamp on the back. The salesperson returned the photos and said that because of the stamp he couldn't make copies unless he got permission from the studio, either by phone or in writing. The couple stared at him in disbelief. They said that the photographer had died in 1973 and his studio had closed long ago. There was no way to get permission--verbal or otherwise. The salesperson made his apologies, but stuck to his guns. No permission, no copies. The elderly couple shook their heads, gathered up their photos, and slowly left the store. Once they were gone I gave the salesperson a dirty look, to which he responded by shrugging his shoulders and saying, "Copyright--right or wrong--no permission, no copies." When you receive your photos take the time to carefully review them before you pay anything. I want clients to love their pictures, but when I give the client the photos that is the time for them to speak up if there is a problem. I will happily reshoot a piece even if it is simply because the artist didn't like the lighting in an otherwise good photo. Your photographer should have a similar attitude. There are situations where I do draw a line. Once an artist wanted a refund nearly eight months after the shoot. The artist complained that they had not gotten into any of the shows they had applied to and my photos must be at fault. I explained that while I could make good photos of their work, I had nothing to do with which shows they chose to apply to, or what the outcome of those entries would be. I have a strong belief that while bad photos can keep good work out of shows, even great photos don't guarantee acceptance.